I gave a brief introduction to Fr. 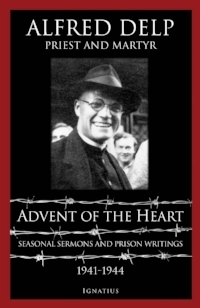 Alfred Delp and the book Advent of the Heart in the post on the First Sunday of Advent. Advent was a topic that concerned Fr. Delp throughout his life (1907-1945). It became a metaphor for his own experience "waiting" for the end of the terrifying Nazi regime. In his case, Christmas became his own martyrdom, when he encountered, not a porcelain baby in a creche, but Christ Himself as the Second Person of the Beatific Vision. Almost in anticipation of this extraordinary journey, his preaching and writings on the subject were gripping theological genius...and very appropriate for our own times. It is ironic that the United States of America, rolling into Germany in 1945 with her tanks of salvation, would one day need so desperately this martyr's words of warning and instruction. I would really like to copy the entire book for you right here..it is rife from beginning to end with essential thoughts for our times. Since I can't do that, it is my hope that you buy the book, read it and continue reading it for the rest of your life, as I intend to do. It is difficult to choose only a few "best" quotes, but I will try to choose those that I feel speak particularly to our own times and are relevant to the theme of this blog. In the coming weeks, I will provide these excerpts, so stay tuned and let's share a journey of spiritual growth this Advent!